This article is about the physical room of a house. For the video game, see Rec Room (video game). A recreation room arranged as a children's play area in a Chicago home. A recreation room (also known as a rec room, rumpus room, play room, playroom, or ruckus room) is a room used for a variety of purposes, such as parties, games and other everyday or casual use. The term is common in the United States, the term rumpus room is common in Australia, New Zealand and Canada, but is less common in the United Kingdom where the preferred term is games room. 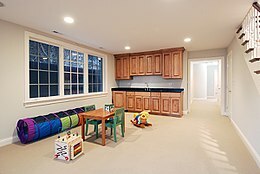 Often children and teenagers entertain their friends in the rec room, which is often located in the basement, away from the main living areas of the house. Usually it is a larger space than a living room to have the ability to serve multiple purposes and entertain moderately large groups. Recreation rooms are normally centered on some form of entertainment, typically an audio/video setup. This can consist of something as elaborate as a projection screen with surround sound or something as simple as a base model television. Couches, pub tables/chairs, bar stools, and recliners may all be used in recreation rooms. Tabletop games are frequent in recreation rooms. In addition to games played on a normal table, recreation rooms sometimes include custom game tables for table tennis (ping pong), table football (foosball), table shuffleboard, air hockey, or billiards (pool). Custom tables for casino games such as poker, blackjack, and craps are also common. Other games include dart boards and arcade games such as pinball and video games. Fridges, microwave ovens, wet bars, popcorn makers, ice cream makers, soda fountains, and classic soda coolers can sometimes be found in recreation rooms.